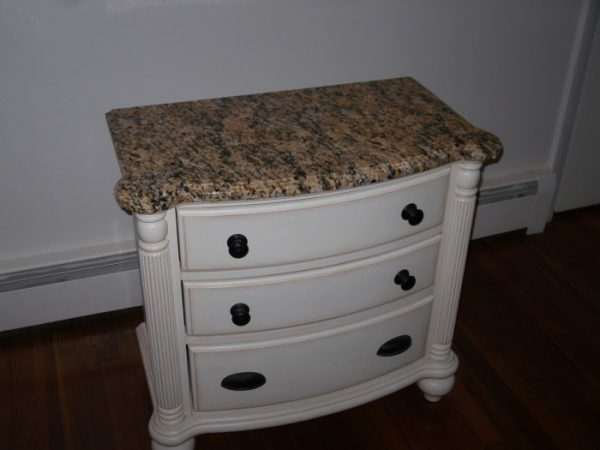 We were provided with a 6′ roll of EZ Faux Granite in order to facilitate this review. Our EZ Faux Granite arrived in the mail! As excited as we were, we had to put off our project for a couple of weeks. You see, we were in the middle of moving in to our house when our EZ Faux Granite arrived. Now, we can get on with our EZ Faux Granite project! 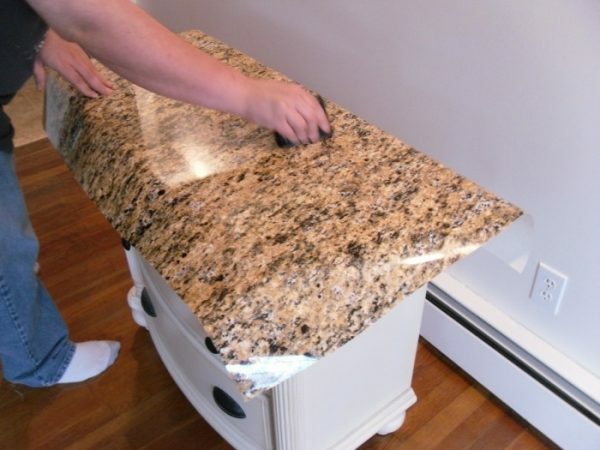 If you’d like to learn more about EZ Faux Granite beyond our review – visit EZ Instant Makeover and watch the video of Rachael Ray doing some Faux Magic on her show! Laying out and trimming was very easy. It’s all in the instructions. 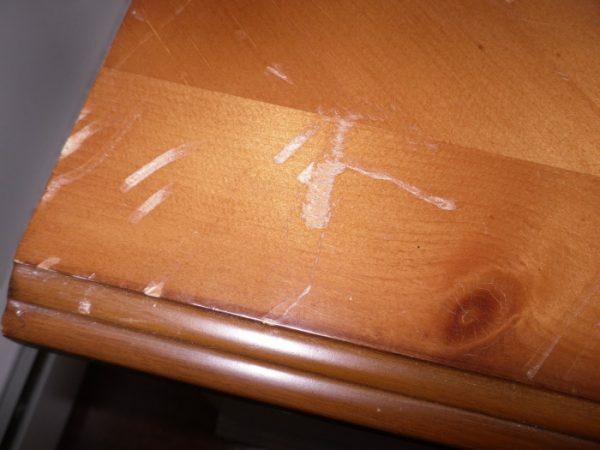 We just laid the Granite Film over the nightstand and trimmed it to the desired width and length (leaving an inch to trim off towards the end! With a larger area, you may want to measure and cut prior to laying it on the surface. There is a grid on the back of the EZ Faux Granite Film which makes cutting simple and keeps your lines straight as an arrow! After applying water to the surface as directed in the instructions, hubby gave me a hand and squeegeed (lol that’s a funny word!) out the bubbles with the wallpaper squeegee. 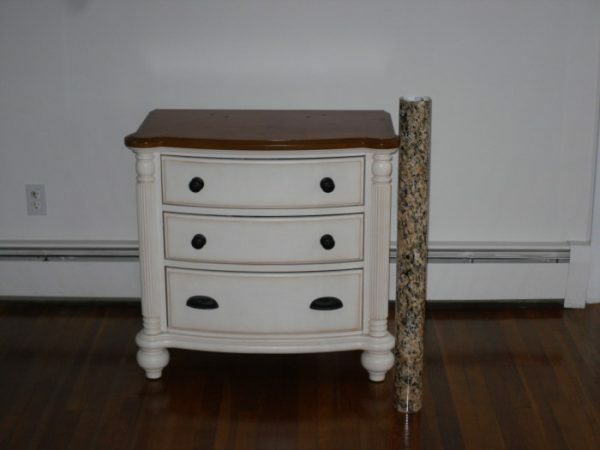 The nightstand has a rounded column shaped “corners” on the front which made getting the faux granite to lay down right extra tricky. 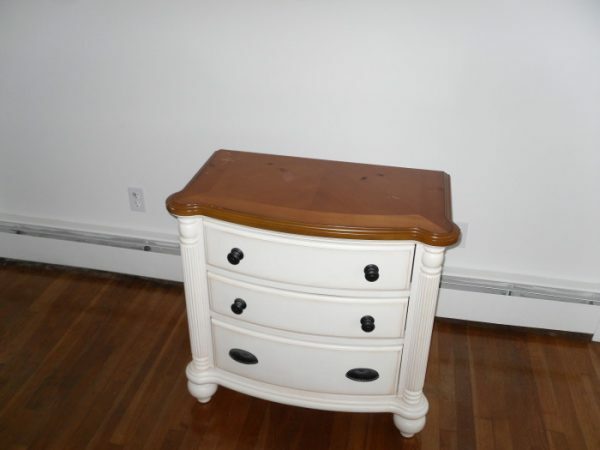 If you have square corners – it should be a breeze! Our edges were also not square, they are like a trickle down rounded off stairway? (LOL) How else could I describe it? You can see the edges and the round bump-out corners very well in the first couple of photos. Completed project. I think it came out very well. We did have to make some relief cuts to get around the rounded corners in the front, everything else went super smooth, fast and it looks great! 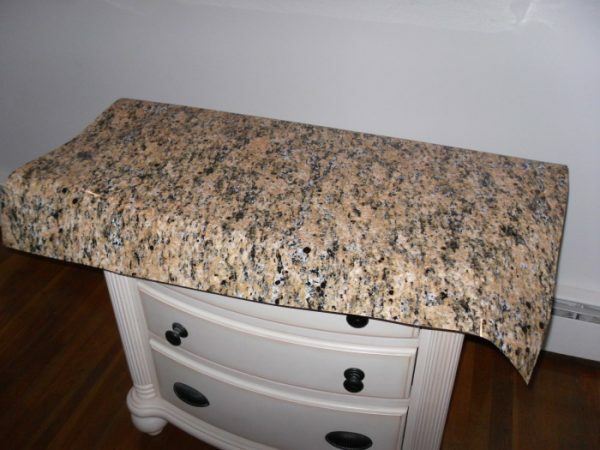 Do you want to try EZ Faux Granite on your next project? Visit stainlesssteelfilm.com and order yours today! EZ Instant Makeover also sells Faux Stainless Steel and Faux Chalk Boards. 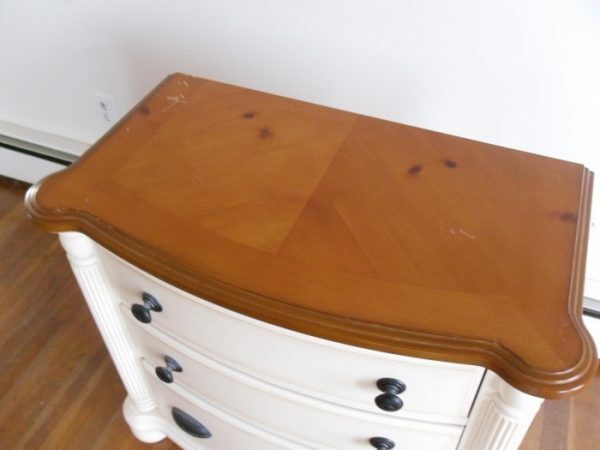 If you’re looking for an affordable way to dress up your kitchen or bathroom counter tops, or even your old night stand, I would recommend EZ Instant Makeover products!